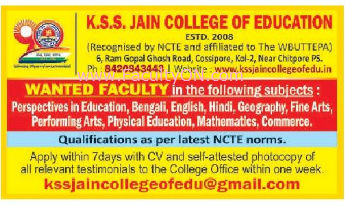 K.S.S Jain College of Education Kolkata has advertised in the TELEGRAPH newspaper for the recruitment of Assistant Professor jobs vacancies. Interested and eligible job aspirants are requested to apply within 07 days from 23rd September 2018. Check out further more details below. College Profile: Kamala Devi Sohan Raj Singhvi Jain College of Education (aka KSS Jain College of Education) was established in the year 2006 and got its affiliation in 25th August 2008. The college was founded by Shree Shwetambar Sthanakvasi Jain Sabha in the name of Kamala Devi Sohan Raj Singhvi.